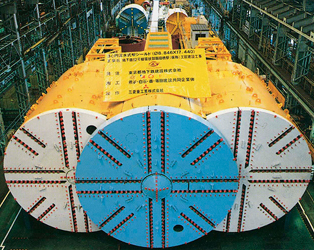 A Double-O-Tube (DOT) shield tunneling machine has multiple spoke cutters. Adjacent cutters are engaged like gear teeth, which controls their rotation synchronously. 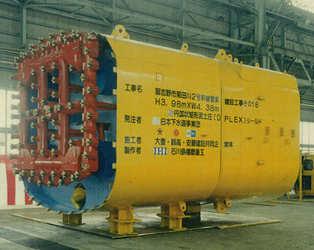 This permits the machine to excavate the face on the same plane. 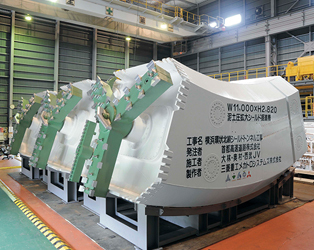 The MF ( Multi Face ) shield machine can excavate a multi-circular cross section by using a plurality of circular cutter heads displaced back and front, and part of them overlapped. 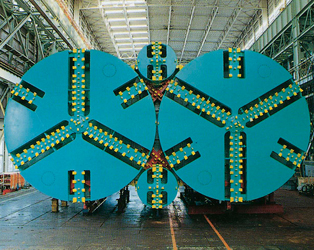 An H & V shield machine features a special articulation system, which drives the machine forward spirally by folding the middle of multiple circular shields in different directions, thereby providing turning force to the shields. This enables continuous switching between horizontally parallel tunnels and vertically parallel tunnels. 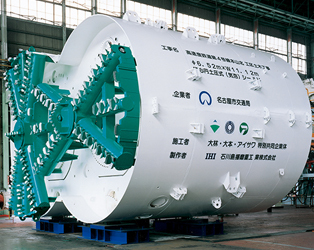 This type of machine is capable of creating arbitrary cross sections, such as rectangular, oval, horseshoe, and circular sections. This is enabled by the parallel link motion of cutter frames. After ground improvement work is undertaken around the outer periphery of a tunnel that has been excavated by a shield machine, the ground around the outer periphery of the tunnel is excavated in a circular form. 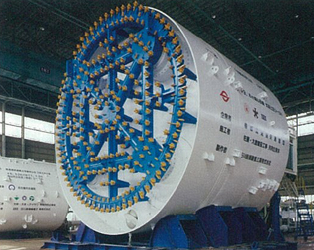 In this way, a specific part of the tunnel is enlarged concentrically. A monorail-rack erector has a T-cross-section rail that is laid along the excavation section in the shield machine. This permits the efficient assembly of segments with a non-circular cross section. 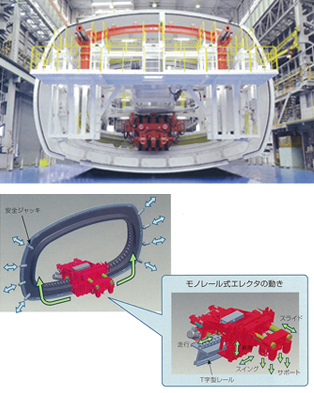 In addition, the T-cross-section rail is spaced away from the main body, which makes the rail unlikely to be affected by any deformation of the shield caused by external pressure or any other force.